For ten years, Tommy lived in a small, steel-mesh cage in a trailer lot in Gloversville, New York. Forcing any human being into these living conditions would be illegal, but Tommy is not human. He is a 26 year-old chimpanzee, and as such, his legal rights differ greatly from those of a homo sapien. Right now, Tommy lacks the right to be free from imprisonment. However, the Nonhuman Rights Project (NhRP) is attempting to change this policy. The organization brought Tommy’s situation to court in New York, arguing that chimpanzees are cognizant, autonomous beings who deserve legal personhood. 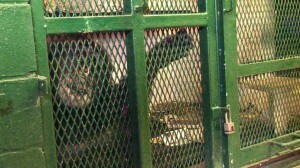 Tommy shown in the cage where he has lived for ten years. This case for the personhood of chimpanzees is taking place in the legal arena, but it brings up certain questions that can only be answered by science. What defines personhood? What are the similarities and differences between humans and chimpanzees? Chimpanzees are the closest living relatives to humans in the animal kingdom, so a high genetic similarity exists. However, there are significant genetic differences that are thought to confer major distinctions between Tommy and his owners. Beyond the genetics, research is also being conducted in a broader biological realm to determine how chimpanzees compare to humans in terms of social and emotional capacities. These empirical comparisons of mental ability will also have strong implications on Tommy’s fate. Certain sites in the genome have rapidly evolved in humans since the most recent chimp-human ancestor, which is referred to by biologists as CHLCA. Three sites exemplifying the genetic evolution of humans are HAR1, FOXP2 and ASPM. HAR1 is a stretch of 118 base pairs that evolved extremely slowly in common ancestors, but began to evolve rapidly in humans. It does not encode for a protein, but rather, seems to encode for RNA. It has a critical function in the formation of the brain, as it is actively transcribed in neurons that develop in the cerebral cortex. The FOXP2 gene is a sequence involved in speech, and it has also evolved with significant variations in the DNA sequences between chimpanzees and humans. There are two notable base substitutions at positions 303 and 325 in exon 7. FOXP2 is a highly conserved protein among mammals, so even these small variations are significant. In fact, while the gene in chimpanzees differs from the human gene, it is identical to the homologous genes found in gorillas and rhesus monkeys, and it contains only one distinction from the FOXP2 homologue in mice. The variation at position 325 appears to have functional significance. It alters transcription regulation for the FOXP2 gene and produces a slight change in the FOXP2 protein’s structure. Since FOXP2 is linked to the development of speech, alterations of where and when the protein is produced in the body could explain humans’ greater complexity of language. Finally, the ASPM gene is related to brain size in humans. It encodes for a protein that is necessary for the development of neuroblasts, which are the precursors of neurons, and as such, has a direct influence on the number of neurons in the brain. Researchers speculate that the ASPM gene has evolved in humans due to positive selection, diverging from the ASPM sequence in chimpanzees. This means that the gene variant now present in humans improved fitness, so it became more frequent in the population. The alteration of ASPM contributes to the difference in brain size between the two species: The brain weight of humans is 250 percent greater than that of chimpanzees. 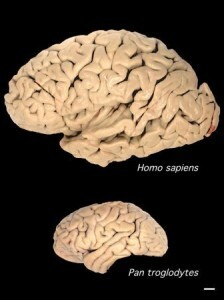 A comparison of the size of a human brain to a chimpanzee brain. Beyond the differences in genomes, variations in gene expression between humans and chimpanzees also influence phenotypic traits. One study compared the patterns of gene expression within chimpanzee and human brains by looking at tissue samples from the cerebral cortex, cerebellum, and caudate nucleus. From these samples, researchers isolated RNA for analysis, measuring transcription levels of various genes. They discovered that 2,014 genes were expressed differently in humans and chimpanzees. This data is significant because it indicates that both sequential and expressional differences contribute to the separation of human from chimpanzee. Genetics, however, is not the only relevant field in primate-human comparison. There are several researchers analyzing the behavior and cognition of chimpanzees, and some of this work is more supportive of Tommy’s case for personhood. A recent study at Georgia State University found remarkable similarities between the personality traits of chimpanzees and humans. The study monitored the personalities of almost two hundred adult chimpanzees, ranking the display of 43 traits on a scale of one to seven. Researchers discovered that a structure of higher-order personality traits exists in chimpanzees, paralleling the hierarchical model of personality found in humans. Chimpanzees also appear to have emotional cognition, or the ability to recognize and process information about members of the same species. This ability to judge social stimuli is a trait strongly associated with humanity. One study showed that newborn chimpanzees attempt to imitate facial expressions, sounds, and actions, which suggests a similarity to newborn humans. Imitation is thought to be a form of social communication, and apparently, it is a mode shared by humans and chimpanzees. Another study found that chimpanzees could discriminate between categories of facial expressions in photographs, ranging from bared teeth (submission) to relaxed lips (friendly approach), even when the subject portrayed was of an unfamiliar species. Chimpanzees might not be consciously aware of their categorization of emotions, but this study shows that they do possess a basic understanding of the emotional meaning behind facial expressions. The same study found that chimpanzees respond physiologically to videos with strong emotional content, such as apes being injected with needles or lying anaesthetized on a gurney. The emotional responses of subjects were measured through skin temperature, since a decrease in peripheral skin temperature indicates negative sympathetic arousal, and in effect, denotes emotion. In these ways, chimpanzees and humans appear to have some crossover in emotional and cognitive processing. Examples of different categories of facial expressions for chimpanzees. These empirical studies are playing an increasing role in the animal rights debate. Although animal protection laws exist, they have historically only focused on preventing animal cruelty. The recent case of Tommy is unique, as it focuses instead on legal personhood. The founder of the NhRP, Stephen Wise, has stated that he is working toward the recognition of chimpanzees as “cognitively complex, autonomous beings.” Wise believes that chimpanzees deserve the basic legal right to not be unwillingly imprisoned. If he is successful in his crusade for Tommy, it will change the legal treatment of animals as property. Wise asserts that the concept of granting legal personhood to non-humans is not a novel idea. Corporations, for example, currently receive many constitutional protections associated with personhood. Similarly, the NhRP’s petition does not argue that Tommy is human, only that he is a legal person. To make this claim, the NhRP is relying on empirical evidence from researchers demonstrating the self-awareness of chimpanzees. However, Wise’s overall approach has received its fair share of criticism. Defining autonomy as the basis for humane treatment, as Wise has, is controversial. Other animal law scholars claim that the primary concern should actually be the ability of the animal to feel and to suffer. Most animals have some basic sense of self—if they did not, they would not be able to survive and thrive. But this does not necessarily justify legal personhood. The NhRP’s actions relate to a body of research that is still expanding. Chimpanzees may not be genetically identical to humans, but they may soon possess some of the same rights. The implications of Tommy’s case extend further than his individual fate. This issue encompasses whether or not chimpanzees qualify as legal persons. Different scientific fields are discovering a range of evidence regarding the capacities of chimpanzees. Regardless of the outcome of Tommy’s case, controversy persists among lawyers, activists, and scientists alike.